Early Treatment Is Key – Let Us Meet Your Child’s Orthodontic Needs As Soon As Possible. Orthodontic intervention can start as early as five years old. This kind of early treatment can prevent help to prevent costly and complicated care during the child’s adolescent years. It is critical to correct any jaw problems as soon as they are diagnosed. Functional Appliances provide children with improved appearance and speech. 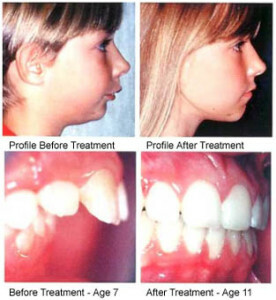 Facial Development – Seventy-five per cent of 12 year olds need orthodontic treatment. Yet 90% of a child’s face has already developed! By guiding facial development earlier, through the use of functional appliances, 80% of the treatment can be corrected before the adult teeth are present! Cooperation – Younger children between the ages of 8 and 11 are often much more cooperative than children of 12 to 14. Shorter Treatment Time – Another advantage of early Phase One treatment is that children will need to wear fixed braces on their adult teeth for less time. Sometimes adults are interested in using orthodontics to help create a beautiful smile. Some adults have jaw and headache related problems. We use orthodontics to solve both these problems. The invisible way to straighten your teeth, without braces. Invisalign® can give you the beautiful straight teeth you’ve always wanted. It works through a series of invisible, removable, and comfortable aligners that no one can tell you’re wearing. So you can smile more during treatment as well as after. Invisalign has been proven effective and is widely available: More than 70% of orthodontists in the US and Canada are certified to treat with Invisalign. TMJ disorders have been called the “Great Impostors” due to the fact that many of the symptoms have overlapping symptoms which often mimic other conditions. Because these symptoms masquerade so many other conditions, many people travel from medical doctor to medical specialist in search of a cure. Most patients never think to contact a dentist since the symptoms are primarily medical in nature. At Distinctive Dentistry of Chester County, we do a complete TMJ exam to determine the nature of your problem. In addition, we have a variety of treatment options to suit your particular needs.